Are you running out of time every morning and grabbing a cereal bar? Try this instead. Start with a container your favorite PLAIN yogurt. Many brands sell 6 ounce containers of plain yogurt such as Chobani and Fage. I have seen both non-fat and 2% fat yogurt. I prefer eating the yogurt with the fat included because it tastes better and this is BREAKFAST. This is the meal that sets up the entire day of energy and mood. Do I want to be hungry and grumpy at 10 AM? Nooooo. Then I add some plain nuts. In this case I added raw walnuts, but roasted almonds, peanuts, hazelnuts, etc. would be a great addition. Choose the one you like the best (without the salt). Toss them into the container or cup and mix in a healthy sweetener such as Honey or Maple Syrup and enjoy. The idea here is to make it really delicious and satisfying even if you only have 3 minutes for breakfast. The calorie count here is going to range depending on what you put in. I don't think it is a good idea to obsess about breakfast calories when you are making a healthy choice. So you are looking at about 400 calories total in this breakfast - compared to the cinnamon bun and the latte - you did pretty well! Do you have a variation on this breakfast? Want To Feel Like Super Girl? My variation is granola instead of the nuts and, well, (blush) I have a 'thing' for canned peaches!! But I a glad you mentioned Chobani and Fage yogurts. A thick yogurt like that is kinda essential for this breakfast. 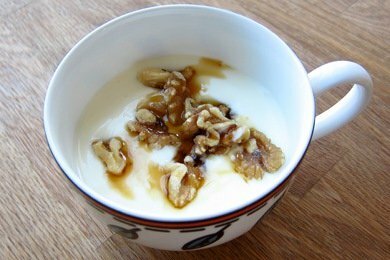 I don't love thin, runny yogurts and you do need the firmness to compete with the crunchy nuts or granola and sticky honey, or syrup, etc. My fave which I pack in a container the night before. Great combo of protein and fiber and keeps me full until lunch. - Fiber One (at work, I keep a zip top bag of Fiber One and I add 1/4 to 1/2 cup prior to eating). I use 1/4 c. nonfat greek yogurt with 1/4 c. each Kashi Go Lean & Original Fiber One cereals, some frozen or fresh blueberries, a small squirt of raw agave nectar and 1/4 t. cinnamon. I have this breakfast quite often (as does my toddler - nearly daily for him), however, I make my own yogurt. A yogurt maker has easy to follow instructions, but a "maker" isn't necessary - I've made it in my slow cooker before. I simply strain my yogurt if I want a thicker, Greek-style. And like the post above, I also add fruit or a handful of a granola type cereal to it. There is nothing but sweet goodness to the Stonyfield Organic Fat Free French Vanilla Yogurt! You should definitely give this a try Andrea. Mmm, sounds good! Have you tried berries too? I always have a smoothie to 'start' the day, however your recipe looks cool and yummy. I adore natural Greek Yogurt, so I will try your suggestion for a week or so..who knows, I may even ditch the smoothies! John you can still have your smoothies. Just use a scoop of Chobani in it. Being a huge fan of smoothies myself I love trying mixing new things together. Lately I've been using carrot juice, soy milk, Chobani vanilla, frozen peaches and raspberries and a handful of baby spinach. For added nutrients I sometimes add bee pollen, ground flax seeds and local honey. Mmmm now I'm hungry! I would love to hear your thoughts on protein shakes for breakfast. omg you saved my life snack girl! The best plain yogurt I've ever tasted is Cabot Greek. I am still in high school and find myself struggling with time for breakfast between showering and packing my bag so this recipe will definitely help me. Thanks!! I take Fage 2% and put frozen fruit and Agave on it in a container. By mid morning the fruit has thawed and when mixed up it looks like a high calorie bowl of Ice Cream but its just healthy and yummy yogurt. This makes me eat much less through out the day because I feel like I cheated when I didn't. I love plain Yoplait light & fit greek yogurt which is only 80 calories per serving and I mix in lemon curd and top with chunky granola. Delicious but tends to be more desserty.